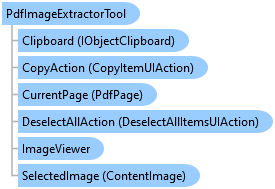 Visual tool that allows to select and extract images on PDF page. This example shows how to highlight focused image in PDF document loaded into image viewer.
' Occurs when the mouse pointer enters the image on PDF page.
' Occurs when the mouse pointer leaves the the image on PDF page. // Occurs when the mouse pointer enters the image on PDF page. // Occurs when the mouse pointer leaves the the image on PDF page.